People will usually ask me what I mean by “living consciously.” And my answer is this, it’s a way of being that allows you to respond to your environment and the people in it by simply…slowing down. But Cristina, what do you mean by slowing down? We live in a time of fast-paced everything, from performing business tasks to our social lives, everything has been abbreviated and done quickly. Sometimes, it can be a good thing, but often in the throes of chaos, your mind falls down the rabbit hole of confusion and disconnection. Living consciously is a commitment. It’s a commitment to yourself and it allows you to show up in the world as a more calm, grounded, and much happier person. These three items propelled me on my path of slowing down, helping me to find my stillness and my happy! The single most effective thing, which has kept me sane in my crazy world by having a small pocket journal to keep a list of three things, I am grateful for every day. Even on our “bad” days, we can be grateful to coming home to a hot shower and a cup of tea. Every day, commit to writing down three things you are grateful for and do that for a month and monitor how you feel with each passing day. When you put your focus and energy on gratitude, a strangers smile; a cup of coffee; payday! ; you position your mind to look at the things in your life that bring you joy, immediately re-directing your brain from dwelling on anything negative. Keep your brain and heart healthy by ending (and beginning) your day with things you are grateful for in your life. When you write these items down, close your eyes and take a deep breath. Feel those things etched into your heart area and just breathe into it. Allow your smile to paint your face and sleep restfully. I am a big fan of Julia Cameron and her book “The Artist’s Way,” and so I give credit to her wonderful idea. See what I did there? That’s what you will fill your three pages with daily. This is an effective tool to accessing your wonderful subconscious and seeing in front of you, all the crap your brain is bogged down with each and every day. When you empty your brain in the morning, your day begins with a clearer mind. 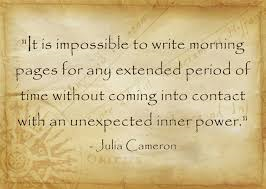 You may experience more energy and as the days go by, your writing will increase. Also, it is best to write it down. The point is to get you connected with your body by putting the actual pen/pencil to paper. Try it out for a week and let me know how this works for you, because I can guarantee it will! Each day may be written in the same way or differently. One day you might write “I have nothing to say” and other days you fill up the paper with a billion random statements. No matter what emotion is pouring out of you, even if you feel bi-polar on paper, be curious about what is coming out and how often it comes up. Curiosity will be KEY in pointing out patterns and making connections from your papers, rather than had just stayed in your head. I’m not saying you must cross your legs and chant or anything like that, but I am asking you to find 10 minutes for yourself and focus on taking deep breaths. Tony Robbins had a quote stating something like ,”if you don’t have 10 minutes you don’t have a life.” This is not about stopping your mind from thinking! BUT, I am asking that you commit 10 minutes to yourself daily to check in and just take deep breaths. Add soothing music if you like, or perhaps, you end up napping, but either way, focus on your breathing. Locate where you have tension and breathe deeply into those areas; let it go. It is a big act of self-love! When you commit to yourself in this way, you shift your position in the world from being stressed out and perhaps lashing out, to being deeply in-tune and grounded. Enjoy! To learn more about Cristina, please visit.